Building Strong Foundations: The key to exceptional Office Management. The relationship between EA and Executive is one of the most profound and critical in modern businesses. But too often the development of these relationships is left to evolve organically over time, with little defined planning or articulation of purpose or process. This course is designed to help remove the lottery of chance, and to accelerate the development of a trusted Partnership, enabling EA and Executive to be confident that it has the right foundations and structure to ensure alignment in all critical communication, task, responsibility and reporting areas, and guarantee a more productive and effective working relationship. The program is delivered over one day, utilising processes of self-discovery and industry benchmarking to elevate the effectiveness of the EA and the Executive, to optimise the performance of the Executive office and to ensure that the Partnership operates at its highest level. The program is designed to enable Partnerships to be benchmarked against leading industry standards developed over a decade from research with EAs and their Executives by the Executive Assistant Academy, and to enable EAs and their Executives to discover best practices and approaches for their own unique Partnership circumstances. 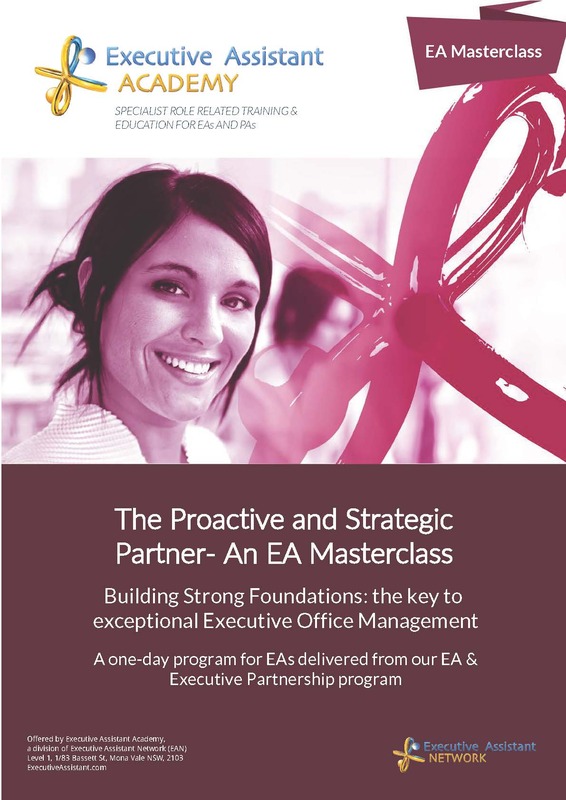 To register online for our next Public Program for the Proactive and Strategic Partner- An EA Masterclass, please click on the appropriate City and Date link below. Further details relating to classroom based training day dates and venues will be sent to all students once we have received your enrolment.